Today's the day that I can finally share my patio, party people! I say finally, but in reality things actually came together pretty recently. When Home Depot contacted me about participating in their patio challenge, I had no idea Mother Nature was going to make things such a challenge. It came down to the 11th hour and we had to push through record low temperatures (which we may be getting yet again this week..grrrrrr), but we got er done! Enough of the sentiments. Go check out the final product! But be sure to come back and tell me what you think....We'll recap everything in depth later this week. It looks amazing Tobe!!! I loved that you repainted the large coffee table to be a side table - brilliant! It looks like the perfect place to entertain or just to relax in :) Congrats girl! Wahoo! It looked beyond my dear! I want to party there for sure! It looks great! I love the Adirondack chairs and how you added little doses of color. Great job! love the textile added in. And let us know later about the fire pit. do you find yourself using it often? I always wonder! Insane. Please come do mine. It's lonely with just a table. It looks great! Hubs and I are also Kansas City-area home bloggers (I'm much more of a newb than you!) at www.LovingHere.com, so I was super excited to see your post on the Home Depot twitter feed. Congrats! And enjoy the awesome patio! You did a crazy great job! I love your colors, it looks really comfy also. I did love your wicker chairs also, but thats just me. Love that set you chose, looks great Tobe! looks amazing! congrats on your cozy space. Love all the potted plants! The patio is amazing! I love that you swapped the spaces. It's totally inviting. You have a beautiful yard! i love that little table stage left. Love it girl, you outdid yourself! Darn I'm so behind. What an awesome double tiered space!! 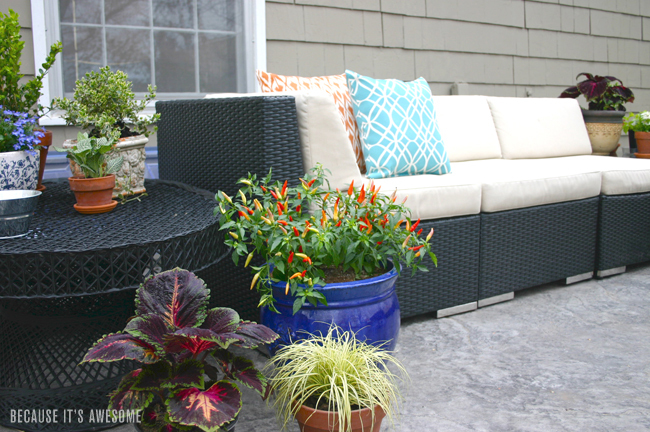 An outdoor sofa is on my dream list and I just love all the colorful pots and plants.